The student parks his 2007, hunter green Honda Pilot in spot 507 of the Red Spring Road parking lot. Depression floods his mind as he pries himself off of his heated seat and into the twelve degree weather. He quickly dresses himself in a North Face coat, puffy vest, snow gloves, and wool-knit hat. He starts the long, treacherous walk to the yellow front doors of the high school. As he finds his bearings after slipping up the stairs that lead to Eugene V. Lovely Memorial Stadium, he hears comments from students flooding the bone-chilling air: My face hurts, or I can’t even feel my toes, or even I almost just ‘ate it’ on that patch of ice! Finally, the yellow doors come into sight as if they were a lighthouse shining to a lost boat out at sea. 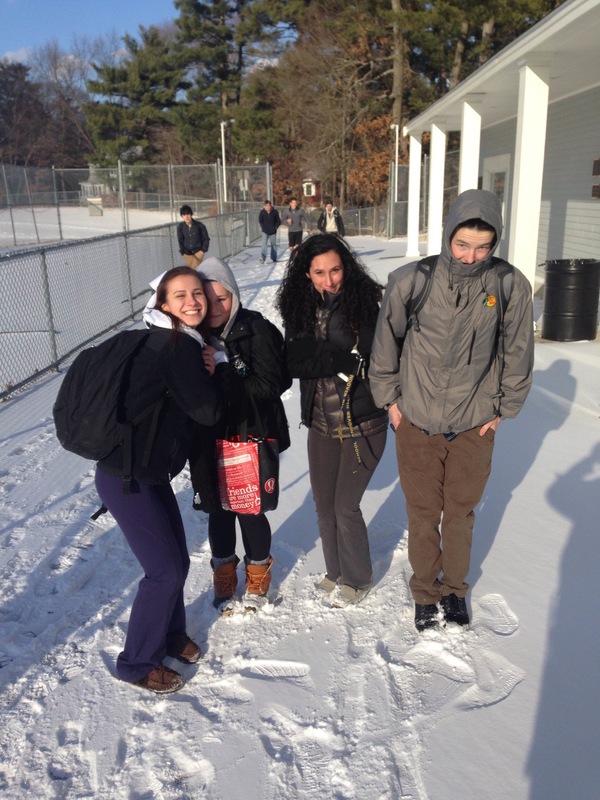 The red faces, sniffly noses, and frozen hair finally enter the warmth of Andover High School. The Red Spring parking lot serves the purpose of providing the juniors (and even some seniors) with the availability of student parking spaces. This gives students that have their licenses the option of driving to and from school, rather than taking the bus or having a family member/friend drive them. Although this may sound like a privilege, when students are asked about their feelings about the walk from the Red Spring parking lot, one often hears It’s horrible!, I hate it!, or other phrases that contain a few profanities. The complaints around this year are just as common as the “need for summer 2k15,” due to the infamous New England winters that we all know and love. Recently, average temperatures have dropped into the teens, with wind chills from negative 25 to around zero. The custodians at the high school are trying to make conditions for the walk as suitable as possible. Custodian Dennis Burm describes the process during winter weather: “We first plow it and remove all the snow. And then we take a spreader out there to put out ice melt to keep it from freezing.” He even said that they have to get out there to start this process at six in the morning! Many of the students have solutions that the school might consider about putting into effect to help out with this walk. Savely and junior Jenna Davison have similar propositions. Who knows what is in store for the future of Andover High School. For now, the only thing that is certain is that Red Spring parkers are going to have to put on those hats and gloves, add an extra layer, and fight through the whipping winds and slippery surfaces on their walk to and from school.